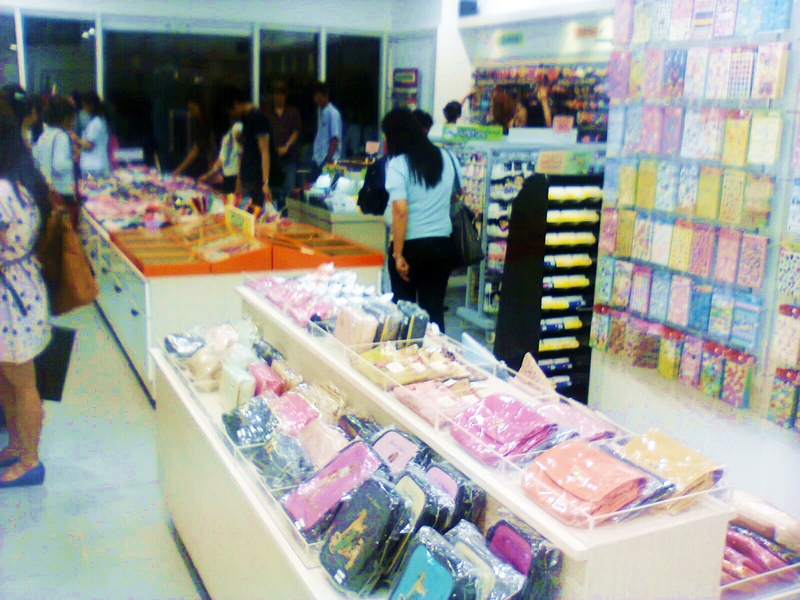 A diary of a self-proclaim makeup geek, her not-so-fancy tips and tutorials,random-ness and her KPOP obsession. Summer is almost over but the heat won't get us through! It's so hot it just makes us want to indulge in cold, scrumptious treats, every single day! And what's better than shaved ice top with "everything nice" for a summer treat? Halo-Halo? Yes, but it ain't just your typical Halo-Halo. Ever tried the "Korean Halo-Halo?" Well, it's cool, simple yet unique in so many levels! Bingsu is a popular Korean dessert usually enjoyed during the summer. Just like our very own Halo-Halo, it is composed of shaved/crushed ice typically with various fruits, sweet rice cakes, red beans and topped with either yogurt, whipped cream or ice cream. Because of it's simplicity ( since it's typically "halo-halo"), there are tons of variations of Bingsu that everyone can easily make depending on their own taste. And since I am madly obsessed with coffee, let me share you my Coffee Crunch Bingsu, of course made special by San Miguel Purefoods Products. 1. Spread the melted-chocolate on the bottom of the glass/bowl. 2. Add the shaved ice(as many as you like). 4. Put a scoop ( or two) of ice cream on top. 5. Mix coffee with a little water to make it more concentrated. Pour it all over. 6. Finish with a drizzle of melted chocolate on top. Enjoy! It's easy right? And guess what? There are tons of easy-breezy recipes like this by My Great Food! Check them out at www.mygreatfood.com and see for yourselves! Or like their Facebook page at https://www.facebook.com/MyGreatFood for more updates! Satisfy that foodie in you together with San Miguel Purefoods Products! Summer isn’t just about the scorching heat of the sun. It’s about good vibes and energy. And what better way to pump your fuel up than to indulge on hearty and healthy dishes that will surely fill you up even on the go. I’ve always been a fan of fusion dishes. And this summer, I imagine the colorful and vibrant cultures of Mexico and Korea. My Seoul Chicken Burrito is one of those fusion recipes I created to satisfy my cravings without feeling too heavy. It’s healthy, it’s fresh—with a little kick on the side. This burrito recipe gives you a modern twist to a classic favorite that everyone can enjoy this summer.
. Grill or pan-fry the chicken until cooked. Shred the chicken meat. Set aside. Cook the Lemon Butter rice by simply sautéing your rice in butter and juice of lemon. Add salt to taste. Garnish with parsley. Set aside.
. Lay the tortilla wrap on a clean flat surface. Assemble the contents down on the center of the tortilla wrap as you like. Fold the sides first then fold the short end of the tortilla up so the contents don't spill out of the bottom. Roll the burrito until the long end, making sure it’s well tucked underneath. Place the burrito in the microwave on medium-high for 20 seconds. Serve it with lemon wedges, kimchi and the special burrito sauce. The sweet and juicy Magnolia Chicken BBQ marinated to perfection, the buttery and tangy taste of the Lemon rice and the fresh burst of flavors from the Kimchi goes perfectly with the Special Burrito Sauce and the creaminess of the cheese. With the use of whole wheat tortilla flour, you can’t go wrong with this easy and healthy dish--of course, made awesome by San Miguel Purefoods Products. But wait, San Miguel Pure Foods has a lot in store for us! Not only they have provided us great quality products over the years but also, they make creative dishes that can make every meal of the day at its best. You can go and visit mygreatfood.com and see them for yourselves. They have tons of genius recipes to choose from and boy, they look mouth-wateringly delish! Have you checked My Great Food yet? Check them out at www.mygreatfood.com or like their Facebook page at https://www.facebook.com/MyGreatFood and see for yourself! Satisfy that foodie in you together with San Miguel Purefoods Products. I, by the way am a huge Skin Food fan. 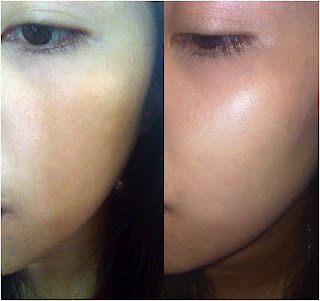 In fact, the Skin Food Peach Sake Pore BB Cream is my absolute favorite. 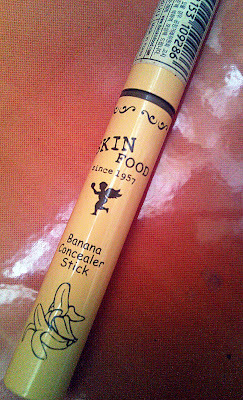 Speaking of favorites, Skin Food once again caught my interest through this concealer which is infused with my favorite lunch time dessert and mid-day snack--- Banana, hence the Skin Food Banana Concealer. Plus points for that banana-ish feel. One thing I love about Skin Food is their creativity when its comes to packaging. And it has a lovely banana scent oh my god. Twistable that makes it convenient to use. To be precise, I have a medium to fair olive with cool to neutral undertones (which is a bit mouthful but is actually very common to Asians, particularly those from the South East. 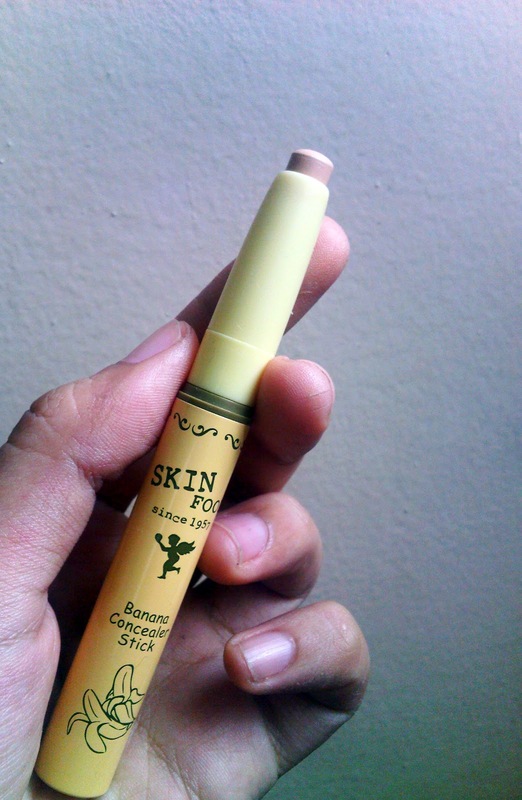 )I know it was kind of silly for me to expect a yellowish tone for this concealer since the name or rather the fruit accounts for the color but yeah, this concealer is perfect for those who have neutral to cool (yellow) undertones. The thing about this concealer is that it glides smoothly on my skin without it being too creamy nor too greasy. I know concealers are meant for coverage but I like how this product is not too coverage heavy but just enough to conceal dark circles and spots without actually caking the area. Plus, it is also very light and easy to blend. Dark circles alert. In this photo (w/ flash) you can see these faint green veins on my under eye bags. In reality there are these OBVIOUS green and PURPLE veins ALL OVER my under eye bags. Being a dentalmed student will be the death of me someday. So tragic. (Forgive me for the poor lighting and cam res.) 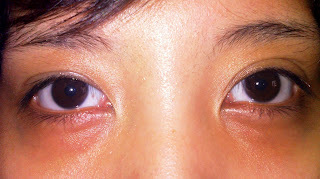 You can see that the product blends on my skin color perfectly and the under eye bag on my left eye was also concealed pretty well. Here's another photo of mine with a bare cheek. 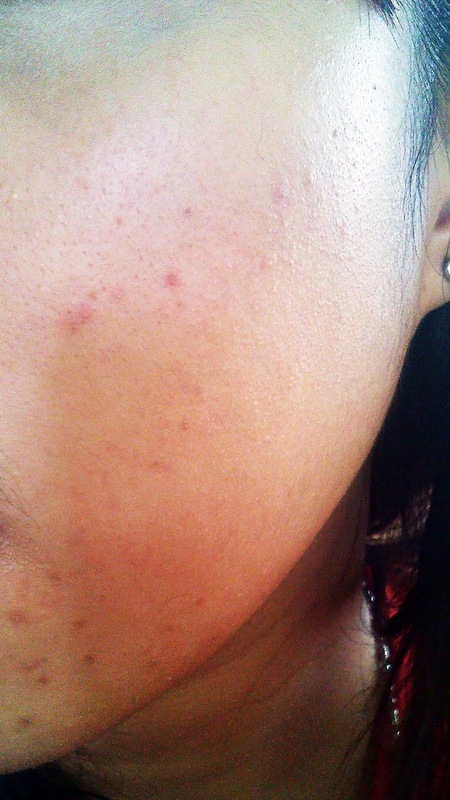 Break-outs season for me. Freaken Lovely. 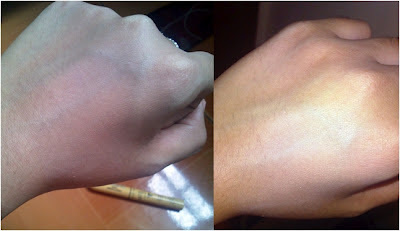 After applying The Skin Food Banana Concealer on all the dark spots, I used Missha M Perfect Cover BB cream in #23 with my mom's (abandoned) Estee Lauder Double Wear Stay in Place Dual Effect Powder in 36 Sand to set the whole thing. Overall, this has become another favorite concealer of mine. Not only it suits my color very well but it has good coverage but light on the skin at the same time. It is not overly creamy and greasy but also not the type that cakes on the skin especially for those who have dry skin and those who have fine lines. 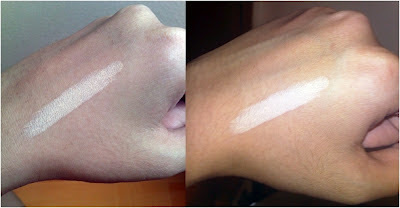 But if your seeking for coverage heavy concealer, this formula might not be for you. Since it's very light for the skin, I normally use this only during the day. Will I buy this again? : Yes, certainly. (Although i'm not sure if this product is still available in Skin Food Megamall because last time I checked, the saleslady told me they don't have stocks for this anymore. 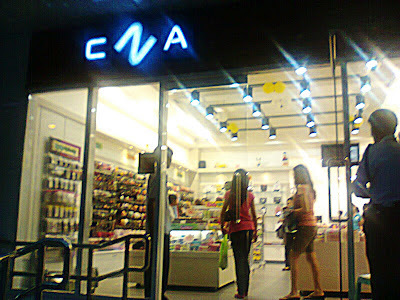 Good thing because I couldn't just imagine how pricey this could get when Skin Food Phils decided to restock.) 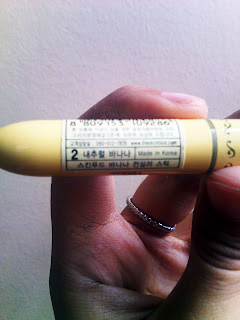 Anyways, I bought this one online, straight from Korea for only 400+. Yeah but that didn’t happen because we went there earlier than expected. The little visit was sure an untimely one. A friend of us ditched her 6:30pm class for this (talk about B.I. friends ) and we have this org meeting to run after. Plus, it’s a Friday and we’re just so clever to go there during the peek hours in all mighty Malate. 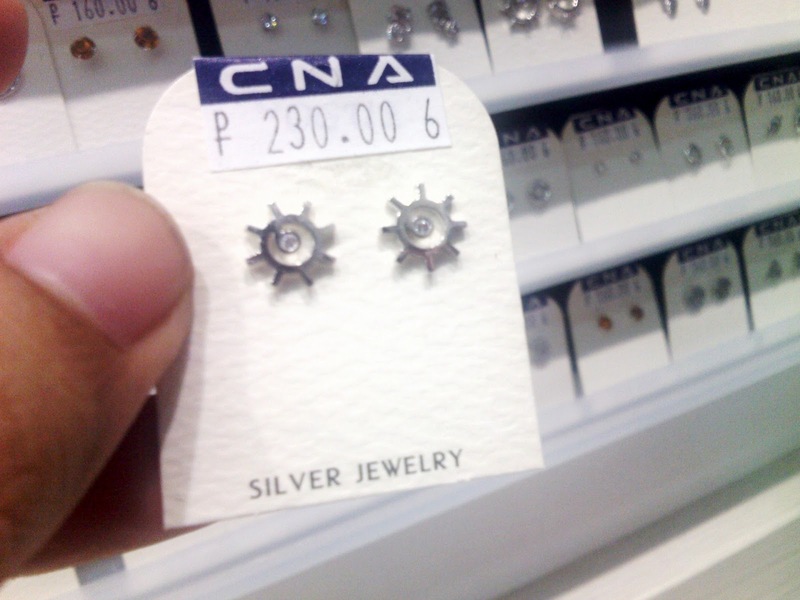 But then I would say that there are no regrets whatsoever because C.N.A Philippines just sucked the living kikay souls out of us. There are moments we, 21 yr. old adults literally spazz on a random item just because it’s cute, it’s girly, it’s sparkly, it’s unique and yeah… it’s Korean! C.NA. 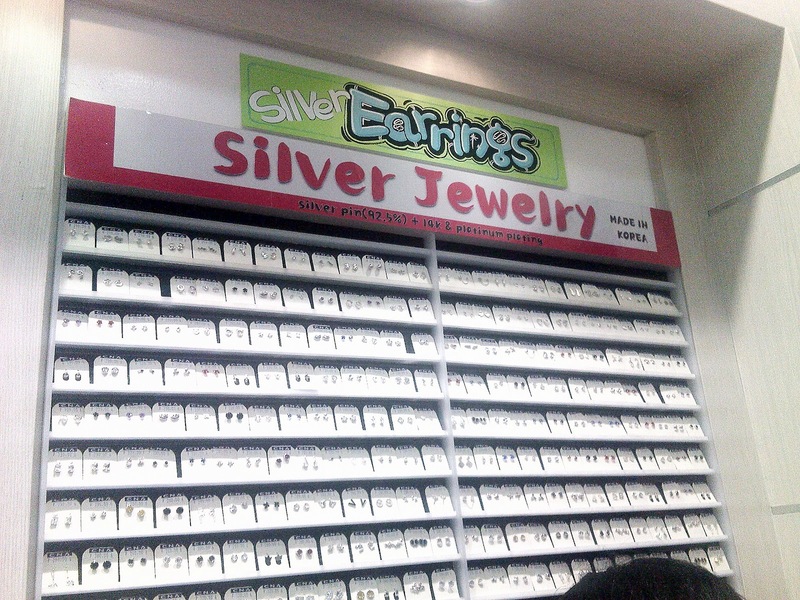 Philippines opened their first branch in the country last May 19, 2012 at the ground floor of University Tower in Malate Manila. The shop sells practically every girl’s kikayssentials from jewelries, accessories, stickers, cosmetics, beauty products and the rest and all are 100% made in Korea. 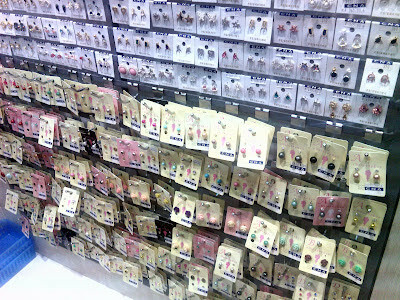 Oh and did I mention that this store is such a Kpop haven? It's like the currently hibernating omnipotent soul of fangirl-ness in me was suddenly unleashed. 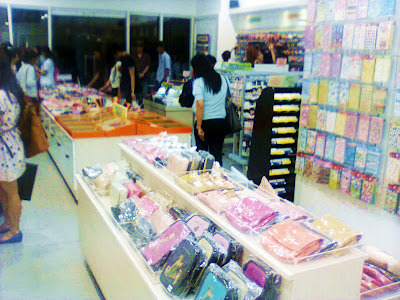 The store was actually very spacious, and since they have a lot of patrons from all over the city, the space is enough for quite a handful of crowd to roam around the store without bumping on each other. The lighting is also very pleasant, plus Kpop music (and MV's) were playing nonstop that gives off this lively vibe inside the store. The staff were also very friendly and accommodating. 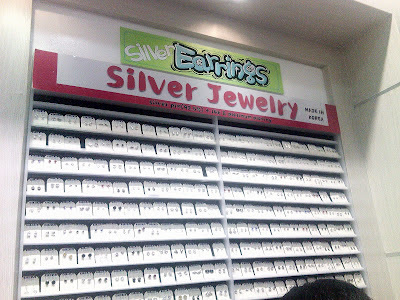 I didn't have any worries while covering their shop because they all attentively welcomed our queries about the store and their products. 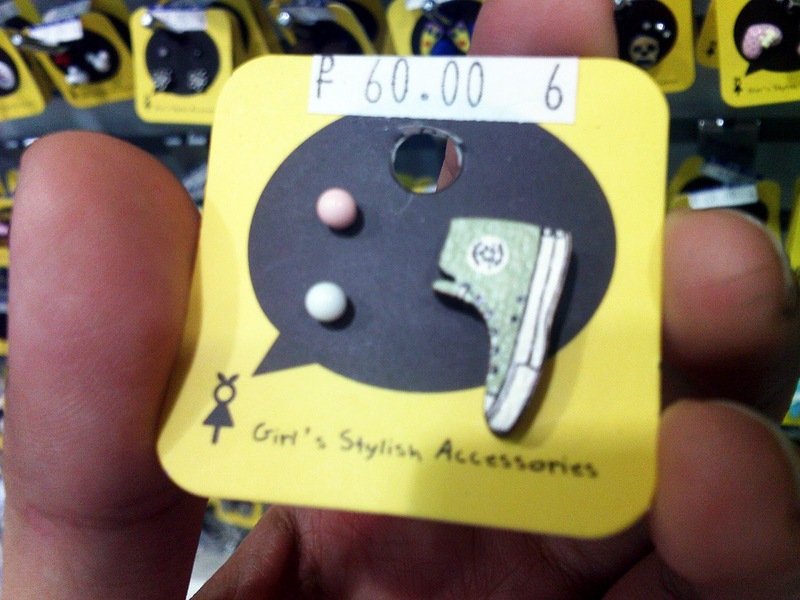 Oh---speaking of which, let's start with the earrings. Two seconds of my life was wasted gawking from afar in sheer amazement. 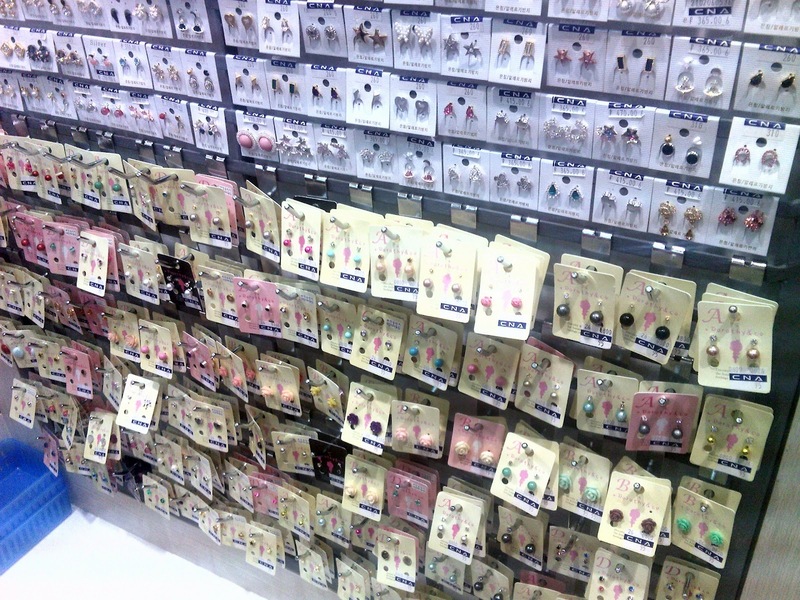 There were a lot of earrings. And I mean, A LOT. These were( I think) the pricier earrings that is made of 92.5% silver + 14k platinum plating(whew, that's a mouthful) They have a lot of unique styles to choose from plus these earrings do not tarnish easily. This is my favorite pair! This reminds me of EXO-K Bacon's (Baekhyun) symbol in Mama :) There are more unique pairs like this one so you better check every single one out! 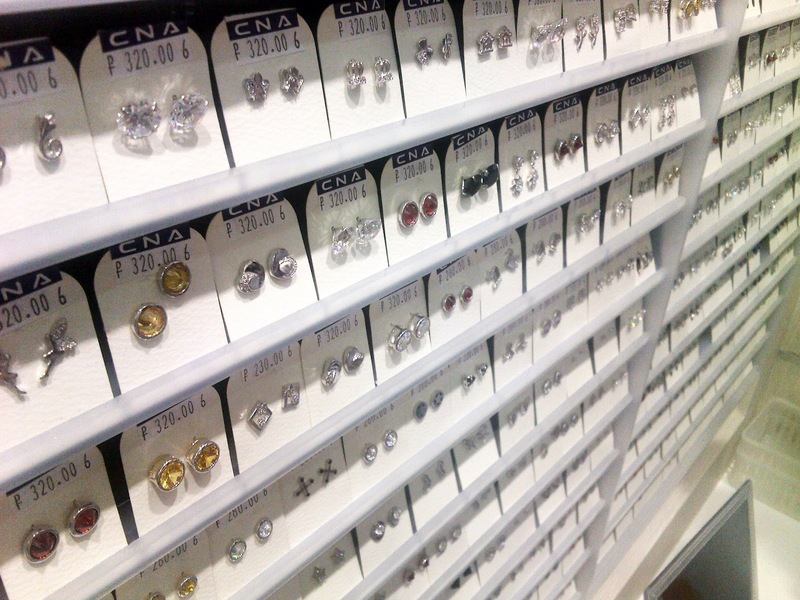 If you guys have multiple ear piercings, you get to choose the cooler designs! 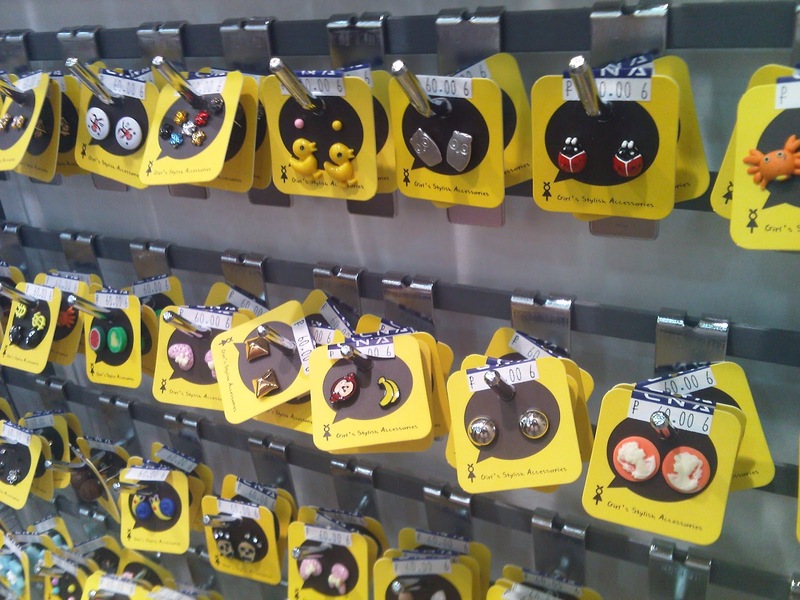 Ah, we so envy these people that on our way back, we even talked about having our ears pierced! 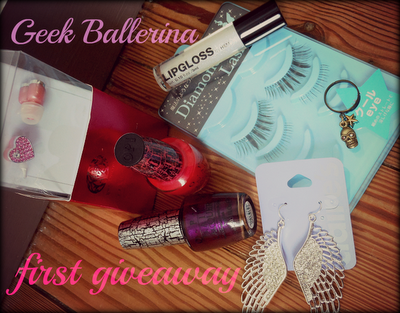 In celebration of her 150+ followers, the awesome Geek Ballerina will give away these super cute prizes every girl will surely love! Click the link above and be sure to check all her amazing prizes! SkinWhite and Nuffnang bring you Snow White and the Huntsman! This year, relive our childhood fantasies with a breath of fresh air of a classic fairy tale, reclaimed with mind-boggling twists and turns that will surely captivate even the not-so-child at heart. Watch Snow White and the Huntsman on May 31st in cinemas near you! In this modern day and age where women are no more damsels in distress living in castles, the harsh environment being our skin's ultimate villain prevents us from achieving that beautiful, blush white skin every prince charming out there couldn't just resist. Get a chance to win a Canon EOS 600D DSLR Camera and other exciting prizes from SkinWhite! Click the link above to join. Sweep your prince off his feet instead and make him fall in love with you and your beautiful, blush white skin, only with SkinWhite. Hi guys! In my recent post I told you about some basic information regarding the Korean makeup trend that is getting popular not only in Asia but in western countries as well. Now that I have already shared some of my insights as well as tips in order to achieve this look, let me take you further by sharing some of my step-by–step tutorials, starting on the eyebrows. Korean eyebrows, as I have mentioned, have been gaining popularity for giving this youthful look that has been strongly distinct in Koreans these days.The idea of having straight, bushy eyebrows can be a little daunting to some (especially for women) but Koreans in contrary have been totally rocking the look. Since most Asians, particularly the ones from the East have relatively soft facial features, thick, defined brows can actually accentuate the features as well as giving off a better frame to the face. Arbe is a full-time dentistry student and a part-time artist. She is a budding make-up geek who wishes to learn more and experience the true "magic of makeup"